Image Transfer Review: Aeon Flux's unique visuals come across very nicely in this transfer, which is very clean, with bold colors, excellent detail, and good shadow details. Edge enhancement isn't an issue. Very nice. Audio Transfer Review: As you might expect, this sci-fi film has a lot of action scenes that will but your sound system to good use. The front soundstage is nice and wide, and blends very well with the surrounds, which carry the score and the sounds of bullets ricocheting and whizzing by. 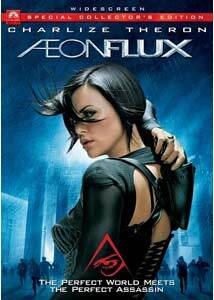 Extras Review: The making of Aeon Flux is explored in two commentaries and five featurettes that cover fairly familiar territory in an entertaining, largely informative fashion. Aeon Flux exists about two steps away from utterly ridiculous, but it's ultimately an enjoyable, appropriately cartoon-y update of the MTV animated series, and hardly the goose egg its critical reputation and theatrical gross would have you believe.